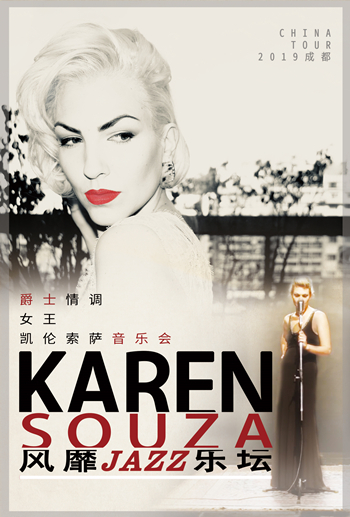 Karen Souza Tour in Chengdu will be held at Deluxe Concert Hall, Chengdu on May 3, 2019. Although Karen Souza's voice seems to be made for Jazz, her career began under different pseudonyms, writing songs and providing vocals to several electronic music producers, which made her part of many House hits. Karen started flirting with Jazz when she was invited to participate in the first album of the Jazz & 80's series. Back then, no one could imagine how successful these series would become overnight. Essentials, her first album, compiles Karen's best renditions from these albums, and it immediately became a sales success. By the middle of 2011, Karen and a classic jazz trio, began to perform all around the world. That gave the audience the chance to meet her in person. In 2012, Karen released Hotel Souza, an album that brings her back to the composition sessions, but this time her new record was produced by Joel McNeely, famous for his work with Tony Bennet and Peggy Lee.